On Sunday morning I read more rain will fall in Colorado throughout the day. It could affect rescue efforts and further soak the land that could result in more flash floods. I decide to write. Last Thursday as the devastation was unfolding I wrote all day and evening. I ended the piece “Boulder Flooding” with these words: Will the death and devastation from this week’s flood in Colorado simply pass us by as a mere spectacle? There is now a sincere effort to understand what’s happening. Last Thursday when Boulder County Sheriff Joe Pelle commented, “it is not your ordinary disaster,” he said what he saw, but didn’t apprehend the full scope of this catastrophic flood. I’ll share a bit about science first, and then open the subject up towards a socio–psychological analysis. After “Boulder Flooding” was published on Friday, I received numerous comments from readers, including from several Coloradoans. One comment that many of them shared was this: The TV is certainly covering the event and showing the devastation, but no television journalist is raising the question if global warming played any part in causing (or amplifying) this flood. I don’t have TV, but if their assertion is true then it’d be yet another example of the lack of critical analysis in American journalism. In my last piece I had mentioned artists’ role in addressing the climate crisis by discussing Mary Miss’ 2007 outdoor installation “Connect the Dots” in Boulder. Working with scientists Mary had made visible the high water mark of a 500–year flood in the Boulder Creek. Last Thursday, based on rain data from the National Weather Service, Joe Pelle had said that the current deluge in Boulder is a 100–year flood. A 100–year flood is defined as a flood that has a 1% probability of occurring in any given year. It is expressed in terms of flow rate: “Based on the expected 100–year flood flow rate in a given creek, river or surface water system, the flood water level can be mapped as an area of inundation” (Wikipedia). Thinking in terms of the flow rate clears up the misconception that in a given century only once such a flood would take place in a particular river/creek. We’ve come to know now that the flood in the Boulder Creek is instead—a 1000–year flood! Andrew Freedman, senior science writer for Climate Central wrote an excellent article “Colorado’s ‘Biblical’ Flood in Line with Climate Trends.” Based on 1981–2010 average rainfall data, Freedman points out that Boulder “gets about 1.7 inches of rain during September.” As of his writing Boulder had received 12.3 inches of rain. Based on that he had concluded that the current flood in Colorado qualifies “as a 1 in 1,000 year event.” He also pointed out that the “average yearly rainfall in Boulder is 20.68 inches.” As of this writing, more than 15 inches of rain has already fallen, and more is predicted for today. So it is no surprise that the National Weather Service Director Louis Uccellini said, “This is clearly going to be a historic event." There are two things to note in Freedman’s analysis: the actual volume of rain that has fallen, and the timing. Month of September is not known for heavy rain in the American southwest. Between March 2006 and December 2009, almost everyday, I walked in a five–mile radius around my home in the suburb of Santa Fe—for the project Where I Live I Hope to Know. July and August are the two months when we used to get rain—mostly in the afternoon. The summer rain is so significant for the desert ecology that I had done an entire series of photographs, “Often I Look Up at the Sky and Wish for Rain.” September was never the month when heavy rain would fall in The Land of Little Rain. So 15 inches of rain with still 15 more days to go in September is indeed “biblical,” as the National Weather Service put it. “Although the overall climate of the Southwest may become drier over the coming decades, a greater proportion of the rain that does fall could be in the form of heavy precipitation events,” Freedman writes. And this finally may explain the “frequent, sharp swings between drought and flood” in the American southwest. During my four years of walking in New Mexico, I had learned that the ecology of the desert needs—slow, steady rain that gets soaked into the soil and the aquifer. Heavy downpour simply washes away. So the prediction of “heavy precipitation” is not good news for the desert ecology. Freedman points out that while the National Weather Service was able to forecast heavy rainfall a week in advance “the magnitude of the rainfall and the repetitiveness of it in some critical areas was not pinpointed” ahead of time. In few recent instances, reality has surpassed scientific predictions. For example, the actual sea ice extent in the Arctic Ocean in September of last year was lower than what the scientists (including from the National Snow and Ice Data Center in Boulder) had predicted just a few years ago. And, working with scientists, Mary Miss had presented an outdoor installation to make visible a 500–year flood in the Boulder Creek. The reality in Boulder is worse than that. Many contributing factors, combined with feedback loop in some cases, make it difficult (if not impossible) to predict precisely the severity of a particular extreme weather event. How do we understand, and then communicate, the cause–and–consequence of extreme weather events in a globally warmed earth? When an extreme weather event happens scientists try to understand it by comparing against historical data. They also do comparative analysis of similar recent events across other geographies. The latter approach is an example of connecting the dots, a phrase that has become a staple of climate change communication. We connect the dots not only across similar events across countries, but also across different events within a single country. But what we have not yet looked at carefully is—repeated assaults—in a particular geography. Colorado would be a perfect example to study that concept. In the last decade and a half Colorado (and its neighbor New Mexico) has gone through three major assaults—massive tree deaths, massive wildfires, and now massive floods—each in turn has been called “the worst natural disaster” the region has seen. Each in turn has also made the next one worse—millions of dead trees made the wildfires worse, and we are now learning that the wildfires are making the floods worse. Several species of bark beetles have ravaged forests all across the American West—Alaska, Arizona, California, Colorado, Idaho, Montana, Nevada, New Mexico, Oregon, South Dakota, Utah, Washington, and Wyoming. The black spruce, white spruce, ponderosa pine, lodglepole pine, whitebark pine, and piñon have all been devastated by recent bark beetles epidemic. When healthy trees become stressed from severe and sustained drought, they become subject to attack: the beetles drill into their bark, lay eggs along the way, and kill their host. In his 2010 blog piece Senator Mark Udall made the connection between dead trees and the potential danger of wildfires. He wrote, “The Rocky Mountain West has been struggling for years to overcome a bark beetle infestation that has drastically altered the visual landscape of Colorado and increased the risk of wildfire.” This summer the Black Forest fire in Colorado destroyed more than 500 homes, killed two people, and was called the most destructive fire in Colorado history. Also this summer the West Fork Complex fire in southern Colorado burned more than 100,000 acres. The Climate Central reported: “The West Fork Complex fire…was sparked by a lightning strike in an area of severe drought conditions. The fire was burning through stands of beetle–killed spruce trees.” Senator Udall was correct in his assessment that dead trees do increase “the risk of wildfire.” Whether beetle killed trees should be removed from the landscape, however, is a complex ecological subject that involves the well being of non–human communities. Some ecologists argue that “wholesale modification of forest structure [by removing dead trees] over large landscapes” could be ecologically damaging. Wildfires make flooding worse. In an article, “Fire and Rain: The One–Two Punch of Flooding After Blazes,” Sandra Postel, a National Geographic fellow wrote last year, “Besides the obvious threat they pose to people and wildlife, mountain forest fires often unleash a cascade of impacts that include flash flooding, mudslides, water pollution and sediment buildup in reservoirs—all of which can exact a big toll.” The reason wildfires can lead to flash flooding, she points out is because “soils laid bare [from fires] cannot absorb the rainfall.” Many fires have burned over the past few years in the Boulder County (the 2010 Fourmile Canyon fire and the 2012 Flagstaff fire) and likely contributed to the ongoing flash floods. It’s Sunday evening now. The rain through the day has hampered the rescue efforts. As of 10:20 pm MST, the Colorado Office of Emergency Management website states: 5 fatalities, 1253 people missing, 11,750 people evacuated, 1502 homes destroyed, 17494 homes damaged. For donation and volunteer, the COEM website suggests using www.HelpColoradoNow.org. As you can see Colorado has suffered repeated assaults—all caused in part (or amplified) by climate change. In addition to the immediate deaths and physical devastations, repeated assaults also create deep psychological scars. Furthermore, the American culture is deeply amnesiac—we forget a tragedy soon after the corporate media stops reporting on a particular catastrophe. But when a region is going through repeated assaults, before amnesia sets in, the next assault arrives. Time has come for us to do more than connect the dots through science. We also need to understand repeated assaults through socio–psychological studies and analysis, not just in Colorado, but wherever on earth it maybe taking place. Subhankar Banerjee is a photographer, writer, and activist. 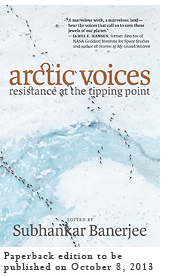 His most recent book Arctic Voices: Resistance at the Tipping Point will be published in paperback on October 8 (Seven Stories Press). He was recently Director’s Visitor at the Institute for Advanced Study in Princeton, Distinguished Visiting Professor at Fordham University in New York, received Distinguished Alumnus Award from the New Mexico State University, and Cultural Freedom Award from Lannan Foundation.